Christian stewardship has been defined as the free and joyous activity of the child of God in managing all of life, as well as life’s resources, for our good and for God’s glory. Christian stewardship is a lifelong process, beginning when we start to accumulate resources, and progressing through to the end of our days. The Holy Scriptures speak of stewardship often. The Scriptures present several principles regarding stewardship. First, Biblical giving is proportionate. God’s people have always given back a percentage of what God has first given them. Old Testament people gave back 10% to the Lord's work. This was considered the "Sacred Portion" of their possessions. Proportionate giving is found in the New Testament as well. In Luke 12:48, Jesus says, “From everyone who has been given much, much will be demanded; and from the one who has been entrusted with much, much more will be asked. (N.I.V. © 2011) In Luke chapter 21, Jesus praised a widow who gave two copper coins into the temple treasury. Other gifts were much larger in terms of the total amount but much smaller in terms of the percentage of income they represented. Giving a percentage of income ensures that Christians bear the burden equally. Salvation is a gift of God’s grace. Our stewardship is expressed not as a function of the law, but out of love for the gift of faith in Christ. In the Old Testament, the tithe was the law of the land. But in the New Testament, giving is voluntary. The Good Samaritan gave the innkeeper two silver coins, the equivalent of two months wages, to pay for the care of his injured neighbor. He gave voluntarily, enabled by the love of God to reach out to our neighbor. Third, Biblical giving is a private matter between a believer and the Good Lord. We don’t need to tell other people what our gift to the Lord is – if we choose not to. When we give our gift to the congregation, we know that trusted people, appointed by the congregation, will handle the funds for us. And this information is confidential. The Bible tells us that Jesus was upset by the way the Pharisees had been giving to the temple treasury. They gave with great fanfare. They loved to impress people with the size of their gifts. Biblical giving, however, is a private matter between ourselves and the Lord. Fifth, Biblical giving is regular and ongoing, not sporadic. God’s will for his people is that they set funds aside regularly for the His work. In First Corinthians, chapter 16, the Apostle Paul asked the people to set something aside each week and suggested that the first day of the week – the day of worship – might be the best day to do that. Seventh, God will hold His people accountable for their stewardship. To be a Christian is automatically to be a lifelong steward of God’s manifold blessings. 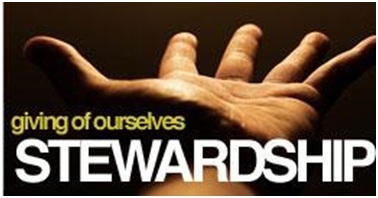 The day will come when God’s people will be asked to give an account of their stewardship. How did we use our time? Were we good stewards of our family? How did we use the Word of God? Did we use our spiritual gifts in a God-pleasing way? Did we use our God-given financial resources wisely? May our Lord enable us to be good stewards of his manifold blessings – for our good, but most of all for His glory! First, consider how God has blessed you. Second, set aside a gift each week for the Lord's work in proportion to your income. Third, do your homework with regard to you financial planning. See our Funeral Planning page, accessible from the top of our homepage, for suggestions. Fourth, consider a planned gift so that the work of the Lord may continue after your passing. Many of our members take advantage of the Pre-Authorized Offering Program made available throughFaithLife Financial. FaithLife financial is a Christian-based, member owned, financial services organization serving Canadian Christians, the majority of whom are Lutheran. “This program enables our members to set aside an offering on a regular basis. This works great for people who are away from worship for a time to continue their support for the Lord’s work through their local congregation. Your pre-authorized gift may be changed or cancelled at any time. There is no cost to you for this service. When our Lord Jesus calls on us to “count the cost”, He wants us to be clear on our wants and needs, and to be informed or educated on the “tools” that are available. In addition, He strongly encourages us to seek His help and guidance in all we do. Since financial planning has such impact for the present and the future, it is wise for us to be informed, to take a second look at what we plan to do, and to seek His counsel and guidance. The XL Spreadsheets have formulas built in, which you may alter if you so wish. This information is not intended to provide an in-depth Bible Study or financial planning. Please consult with your professional advisor (lawyer, accountant, and financial planner) for specific details as they pertain to your specific situation. “The Christian & Finances – Biblical Principles for Money Management” by Rev Mark DanielsonThis information covers many Biblical principles of money management, including many practical helps. Review this from time to time, or when questions come up on specific topics. Funeral Planning. Planning your funeral is very helpful to your family. In addition, it provides you with an opportunity to shape the service. Please see your pastor at the start of this process, and consider including your family as well. Please check our funeral planning guide on the Mount Olive website. Buying a Vehicle. General helps and questions to consider. Debt Worksheet & Working Wives. Track your debt because it represents some of the significant risks you and your spouse carry. The Working Wives form reviews the main points to consider when both spouses are working. Equifax Canada – Consumer Services. Credit Report Information. This helps you know how to check into your credit rating and ensure it is accurate. Identity Theft. Points to avoid becoming an easy target for identity theft. Balance Sheet. This is sometimes called Net Worth. Do this once a year to see how your Net Worth is changing. Monthly Income & Expense. This is a good place to start, to count the cost of your expenses. Take special note of the First Fruits Giving line – prayerfully consider this item before proceeding. Note: There are formulas included in the XL spreadsheet, so just plug in the numbers & watch the totals add. Monthly Cash Flow Record – 12 months. Use this form to track income & expenses for the year. Again, there are formulas built in. Percentage Expense Guideline. To compare what you spend in each category, use this chart. Better yet, go to the next item. Sample Percentage Guideline. This spreadsheet not only contains the expense guide numbers, but takes your financial numbers & shows you by how much you need to adjust your expenses to come in line with the guide. Planning Book – Personal & Financial Inventory. This is an excellent booklet to use in placing all your financial & legal matters in one place, provided by FaithLife Financial. This is especially helpful for an executor to your estate, knowing where to find the information, and making it easier to do so. In electronic format, it is easy to update. Protecting Your Children. This also includes a discussion on choosing a guardian for your minor children. Retirement Matrix. Here’s an easy & quick way to determine the approximate amount of money that needs to be saved for your retirement. Note the assumptions made at the bottom of the form. The end result of good Biblical stewardship is financial freedom. Good stewardship is an important part of the abundant life that Jesus Christ promises His people in John chapter 10, verse 10. Paradoxically, God’s guidelines give us freedom. We are grounded in a heart of thankfulness, not for the blessings we don’t have but for the ones we do have.